Today is World Down Syndrome Day (March 21st) and we marked the occasion by asking everyone to wear odd socks to school! 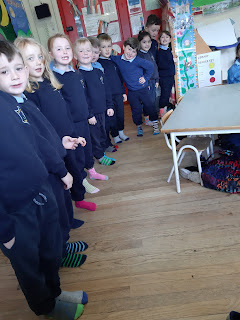 We discussed what is means to have Downs Syndrome and the socks were a great way of helping us all to understand that despite the socks 'looking' different, they're still socks and can do the exact same job as 'matching socks'. 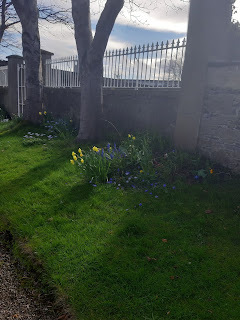 Spring has most definitely 'sprung' and the boys and girls of room 2 were out and about this week, enjoying the mild weather and looking for signs of spring. We saw flowers in bloom, buds on the trees and heard the sounds of birds chirping all around us! There was a buzz in the air! We also checked in on our tulips planted last Autumn, they're coming along nicely, not long now and they'll be in flower! 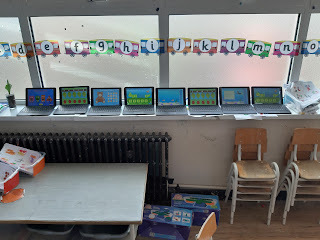 As part of Scoil Mhuire's involvement as a digital school, use of tablets and Chromebooks is a scheduled part of the school curriculum. Children learn maths skills, phonics, literacy and safe navigation using the internet. Linking in with World Book Day, room 2 are having great fun being authors of their very own digital books. Check back with us here to see how we got on. To celebrate World Book Day the pupils of Scoil Mhuire took part in several school wide events. 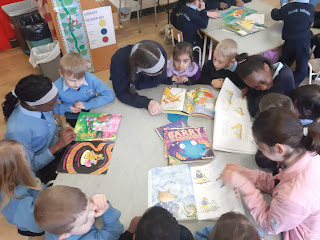 The pupils of 6th class came to visit junior infants and enjoyed some shared reading in small groups. The junior infants were treated to story after story chosen by them and read by 6th class. Thanks to 6th class for coming to visit us! 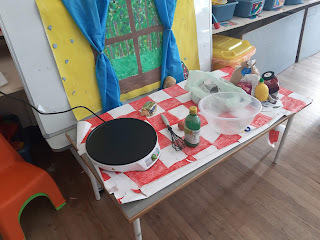 Room 2 had great fun making pancakes on Pancake Tuesday- and even better fun eating them! 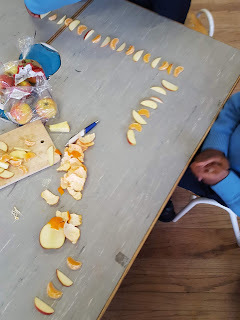 As part of our maths learning, junior infants have been learning all about pattern this term. Three support teachers join us each day to allow us to break into smaller teaching groups to help the learning. The children get to work in small groups or get some one to one support to help them understand the concepts and get a better grasp of early maths. Check out some of room 2's work on pattern from this term. 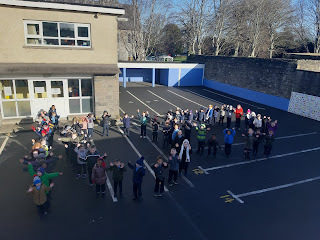 We recently marked our 100th day of school here at Scoil Mhuire (Thursday 7th February) . The three junior infant classes had great fun out in the yard making the shape of 100 out of people! The boys and girls who have not missed one day of school since we started got a special certificate for 100 days of perfect attendance. Well done to all!